At this rate, I'll have our freezers cleared by Christmas! I had no idea we went through meat this slowly, which I guess is why it piled up the way it did. I've always stuck to the "deck of playing cards" or "palm of your hand" sized rule when eating meat, so it takes us a few meals to get through even one package of chicken breasts. In the future I'll have to take all of that into consideration when buying meat. This was a big wake-up call for me! As mentioned before, my brother only ate a few raw veggies or broccoli with cheese sauce on it growing up. My mom has made this sauce from scratch for as long as I can remember to go over broccoli and cauliflower, or to make mac and cheese. It's the same basic format, but you can adjust it using your personal milk and cheese preferences, or to just use up what you have on hand! That's what I was aiming for tonight: using up the last of some 1% milk and shredded cheddar and mozzarella cheeses. I'm heading out of town to visit my parents in North Carolina, so Johnny will be left with a freezer full of whey-free, organic microwave meals, cans of chili, and the local pizza place's number! I know he lived on his own for so long without me and will be fine, but I couldn't help shopping and stocking the house up like he's some invalid! To start, make a roux in a high sided skillet using flour and butter. Cook this for a few minutes until it's thickened. 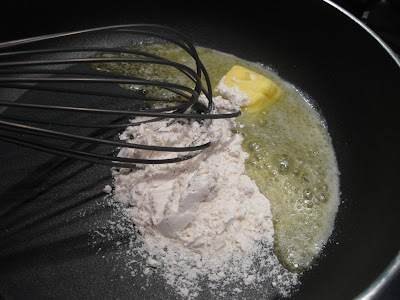 Next, add the milk and whisk so the roux isn't clumpy. Add pepper (white pepper if you don't want black specks in it) and spices of your choice at this point. I usually add garlic and onion powder, but hold off on the salt until I've added the cheese and taste if it needs it. Once the milk has come up to temperature, you can start adding the cheese and stirring until it is melted and creamy. Give a taste, adjust the flavorings if needed, and voila! home-made cheese sauce! It's easy as pie and so versatile. Serve over vegetables, stir in cooked macaroni and bake, or leave out the cheese and have a bechamel white sauce as a blank canvas for many dishes and casseroles! And because we only ate 2 of the thighs, I froze the others to defrost at a later date and was left scratching my head of what to do with this broccoli, cauliflower, and cheese sauce? I know that the cheese sauce freezes well, but Johnny would never heat it up the broccoli and cauliflower and I hated to just throw it out. Then, a lightbulb went off! I spooned all of the cheese sauce into a plastic container and then the broccoli and cauliflower over top with just a sprinkle of the liquid in the bottom of their pan. I got out my stick blender and went to work, pureeing everything together for broccoli and cheese soup!!! I popped a lid on, and into the freezer it went for lunches or a light dinner in the future! - I was able to use up the last of the old milk container and two opened packages of cheese. - I made tonight's dinner. - I have 2 chicken thighs in the freezer for a future meal. - I have a container of soup in the freezer for future meals! In case you've lost track of the Blogger Secret Ingredient (BSI) contest, Lauren at Healthy Delicious is hosting this week and she chose plums! Recipes due by July 19th. I haven't participated in a few weeks, but hope to jump in again at some point! And, on behalf of those allergic to gluten and celiac disease sufferers, please take a minute to sign this petition for Starbucks to bring back their one and only gluten-free cake option. They discontinued it, and our voices can help show them that people notice! There are already so few options for safe, individually wrapped, allergy-free foods, it's a shame to do away with one that was so easily accessible for many people! Just sign the petition, click the anonymous button if you prefer, and check your email to confirm. It just takes a minute, but everybody can help be an advocate in allergy awareness! The part about Rachael Ray made me smile. Veggies w/o any sauce are very blend, your cheese sauce rocks! Brilliant! I love that. Thanks for entering my contest! Feel free to add a shot from here or your Horchata post. Great idea, making that into a soup!! I like the puree of those veggies, but not when they are whole, isn't that strange?? I go through meat very slowly too, it's painful! Great job on using up your leftovers! Girl, you're having too much fun and good eats trying to clear out your freezer! What is this? It's no challenge! I just wanted to tell you that I ended up ordering the Business of Being Born from Amazon. com when you, and another lady, mentioned it in my 27 week belly photo post. I am so glad I did and thanks for telling me about it! I had never heard of it before. It came in the mail yesterday and Rich and I watched it last night. It was great! By the way, your blog always makes me hungry!! Oh, and any news with your brother getting the apprenticeship? Maybe you mentioned it and I missed it? Just catching up on my blog reading - glad I didn't miss anything on yours! pssst!!! what is your email address? i changed my blog to be private.. and if you want to keep reading- email me, amychristine11@gmail.com so i can add you!!!!! The best soups are made this way. The best meals are made this way too. Cheese makes everything better... yum! We love that rice krispie chicken recipe- and the kids gobble it up. Brilliant idea to make your leftovers into soup- way to be resourceful!